This nifty tube keeps scrolls of mattifying paper intact. Its refillable, too. Dewy's a good look. Shiny? Not so much. These blotting papers keep your face in tip-top shape. Their nifty packaging stops them getting crumpled in your bag. Even better, it lets you customize the size of every mattifying sheet. The setup's a little like a roll of aluminum foil, with plastic teeth that cut just-right strips from a scroll inside. (One equals roughly 100 sheets.) Fresh out? No worries: It's refillable. Just slip a new scroll in and get to dabbing at midday shineor putting the finishing touches on your makeup. Made in China. 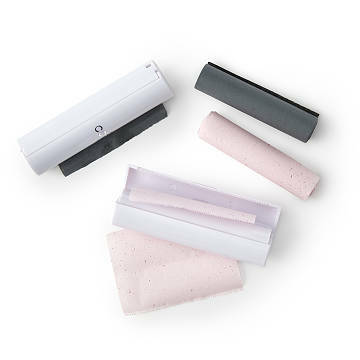 Charcoal blotting paper is infused with detoxifying charcoal to actively purify pores. Rose blotting paper let you bask in the sweet floral fragrance of natural rose aside from giving you the matte and refreshed look.